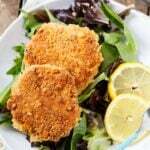 Southern Salmon Patties are quick and easy to make from canned salmon and just a few other ingredients you are likely to have on hand. 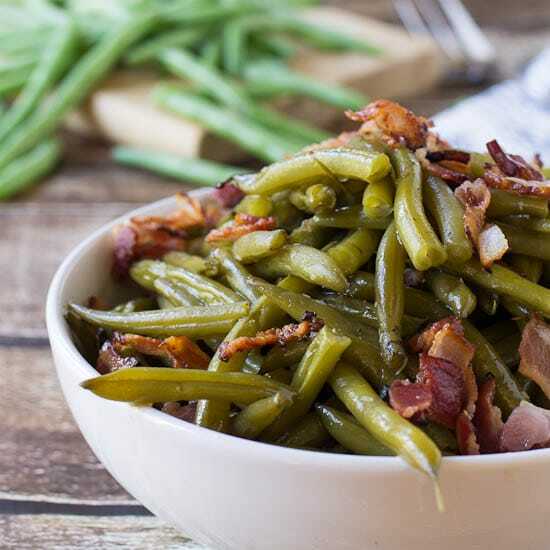 Serve them with tartar sauce and a few southern sides, over mixed greens with a little balsamic vinaigrette, or make a sandwich out of them. Any way you do it, they make an inexpensive but delicious meal with plenty of protein. I love salmon and almost always use fresh salmon. Salmon Patties are really the only time I use canned salmon. I like to keep one or two cans in my pantry. 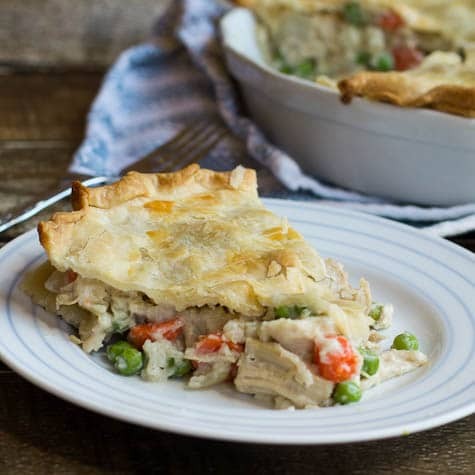 The other ingredients are all things you are likely to have on hand so this recipe can be whipped up for a quick meal. The canned salmon, I buy Pink Salmon, needs to be drained and mashed up with a fork. You’ll want to pick through it and remove any pieces of skin and bone. If you are a little squimish about skin and bone being in canned salmon, Chicken of the Sea sells it in 5 ounce pouches. It is more expensive than the cans but it tends to be much more cleaned up than the canned stuff and I have never had to pick any skin or bone out of it. The salmon gets mixed with mayo, onion, cajun seasoning (I love Tony Chachere’s ), lemon zest, and an egg, plus some crumbled Saltine crackers. 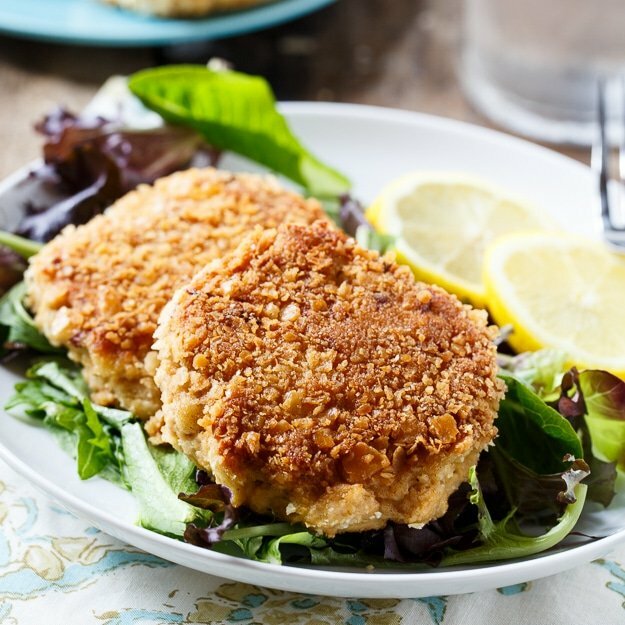 They are formed into patties and coated in more Saltine cracker crumbs, then pan-fried until crispy. Since the salmon is already cooked, this only takes a few minutes. Tip: Refrigerate the formed patties for at least 30 minutes before frying and they will hold their shape better. Drain salmon and remove any skin or pieces of bone. Place in a medium bowl. Add mayonnaise, seasoning, lemon zest, and 10 crushed Saltine crackers to bowl. Stir well. Taste for seasoning and add desired amount of salt and pepper. Place the remaining Saltine cracker crumbs on a plate. Heat vegetable oil and butter in a large pan. 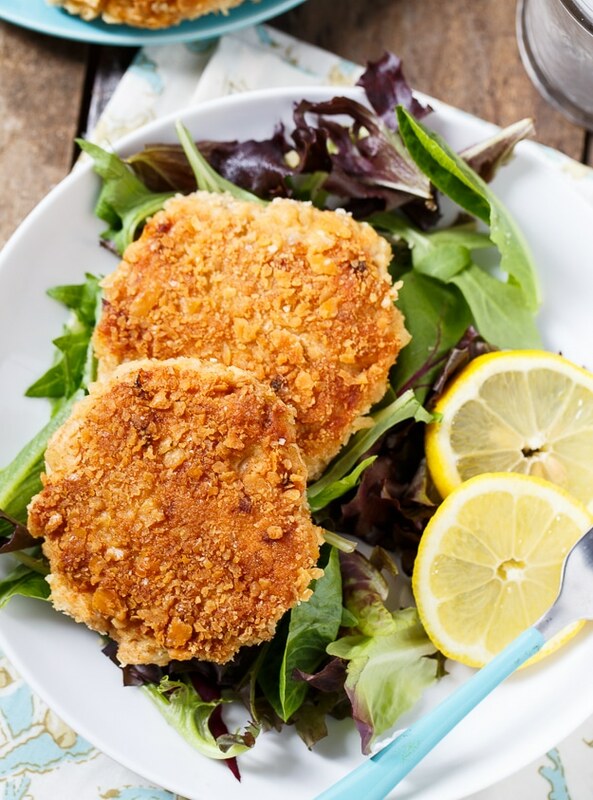 Dredge both sides of salmon patties in cracker crumbs. Place in pan and cook until golden on both sides. This entry was posted in Appetizers, Lunch, Meal and tagged salmon, seafood. Bookmark the permalink. I have oyster crackers I wantto use for the salmon patties. How much should I use for 1 14 oz. can of salmon? I see chopped onion on the ingredient list, it goes unmentioned in the actual recipe. I love salmon patties I do clean the canned salmon to some extent for excess fat and skin. But, I think the bone is very healthy and unnoticeable once cooked. By the way a question earlier asked could you substitute tuna? Yes. I have done it in a pinch and it’s very good in its own way. I tried this recipe because I had a couple of cans of Trader Joe salmon that I needed to use. All I can say is WOW! If I didn’t have some self control I would have eaten everything in one day. Instead of cracker crumb coating I used Louisiana Fish Fry Seafood Breading Mix. I highly recommend this recipe. We tried them with the Louisiana breading vs saltines. The saltines won hands down. We made them with louisiana fish fry seafood breading first. My family’s response was “meh”. I went back to original recipe with the saltines; all is well in the kingdom. These are AWESOME, great flavor. I’ve tried these twice. They are perfect! They smell AMAZING when they’re cooking in the butter and oil mixture. I serve them with a side of jasmine rice and green beans. Tonight I will be making them again. I have company over. I hope this recipe works well being doubled. I had bad experiences before so I might just prepare them in two seperate bowls to be on the safe side. Remove the bone? Please, this fish is processed in pressure cookers. If there is any bone in it, it’s made soft and almost indistinguishable from the rest of the can. I would love such patties for lunch! Salmon is one of my favorite things! Yes I know you can substitute tuna for salmon cause I’ve done it in a pinch and it is very very good also. I eat salmon all the time, but I’ve never had it Southern style! These look so golden brown and crispy — I definitely need to try these! Oh we are always trying to eat more salmon, these look so good! Can’t wait to try them – love their crispy coating! You always take me back to my roots with your recipes! 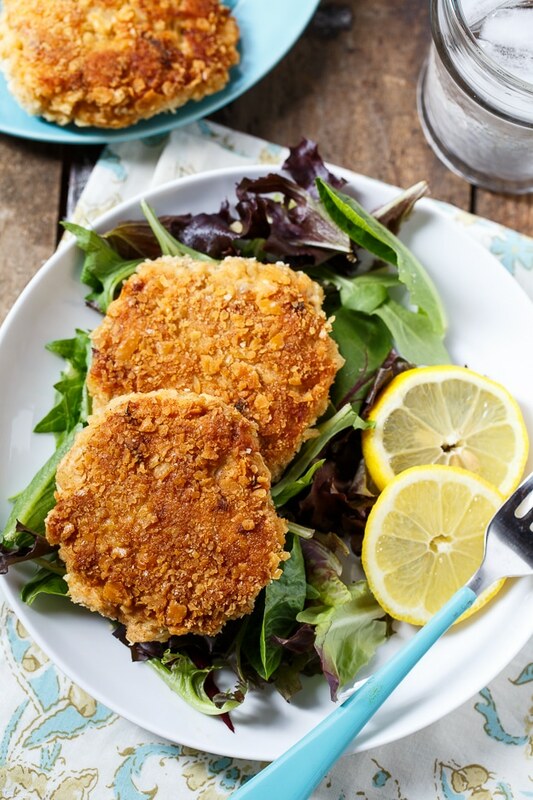 I haven’t had salmon patties in FOREVER… now I must make them ASAP! Yours look and sound delicious! I just love the crispy, crunchy crust on these patties! Looks delicious Christin!